Hunted to near-extinction by the 1920s, European Bison clung to survival in a handful of zoos. Thanks to continent-wide conservation programmes, Europe’s largest megafauna now roams wild in one of its most densely populated regions: the Randstad. Joshua James Parfitt has been bison spotting. I stand gazing out over the dune slacks, as the sun sets orange behind apartment blocks in the distance. Within earshot, a motorbike noisily chases fame or fun at the Zandvoort race track. Distant cars zoom by in their monotonous growl; it seems that nowhere in the Netherlands is safe from the sights and sounds of civilisation. But, behind me, a blond-haired child steps cautiously between tufts of grass as if stalking something. I turn to the child and open my mouth to ask… ‘Shhh!’ the retort comes rapidly. He hides behind a clump of marram grass. ‘The bison are here!’ he proclaims, wide-eyed. The boy had good reason to be afraid. As Europe’s largest land mammal, a full-grown bull can weigh 1,000 kilogrammes, and its shoulders can tower at a height of up to two metres. That’s twice his height — something he probably already figured out while standing in front of the stuffed bull at the Kennemerduinen Visitor’s Centre just outside Haarlem. But that doesn’t answer a different question: what in the world are bison doing here? The European bison is one of two living species of bison. Many of us may be acquainted with the bisons of North America — which were hunted to near-extinction in the 19th century. That’s America, though, with its grizzly bears, ‘wild west’, and Super Size cups; this is Western Europe. Records indicate that the European bison once roamed this continent, from Russia in the east to France in the west. In fact, it was still present in southern France up until the 15th century. Expanding agriculture, civilisation, and hunting eventually pushed the European bison from much of its former range until it survived in just two forested enclaves: the Białowieża Forest in Poland, and the Caucasus region on the Russian border with Georgia. Retreating German soldiers slaughtered all but nine animals in Poland after WWI — they were locally finished off by 1921 — and the last European bison was hunted down in the Caucasus in 1927. The bison were gone. Often the source of criticism from the environmentally-inclined, it was the zoo that saved European bison from extinction. From a starter pack of 12 animals held in captivity, they now number close to 5,000. 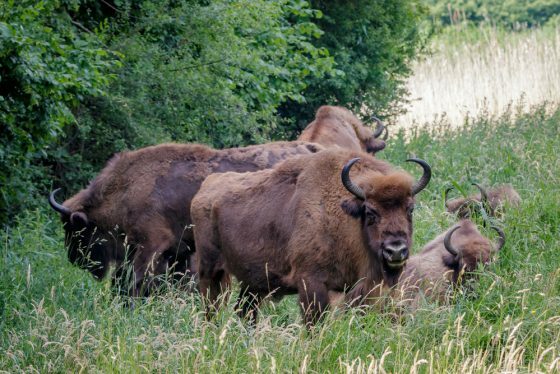 After their reintroduction into the Białowieża Forest in 1952, Poland has now exported their bison to 14 European countries. One of the smallest countries hosting a bison herd is the Netherlands. Here, the megafauna can be seen in the Hoge Veluwe national park in Gelderland, the Maasthorst nature reserve in Noord-Brabant, and in the Zuid-Kennemerland national park in Haarlam — tucked inside the densely-populated Randstad metropolis. So, how did it happen? Much of the fuss is to do with the word ‘rewilding’. Whereas the environmental movement is clear about what they are against — fossil fuels, plastic pollution, hydroelectric dams etc… — English journalist and advocate George Monbiot says that rewilding is the movement’s chance to declare ‘what we are for’. Rewilding means the rehabilitation of nature; not just the gazetting of national parks, but the restoration of ecosystems and the food chains therein. Before you run for the hills (which you can’t really escape to in the Netherlands anyway) the wolves only briefly cross over from the German border. The presence of bison, however, is not just something to excite ecologists and frighten the rest of us. According to Yvonne, European bison are known as a ‘keystone species’ that engineer greater biodiversity just by, well, being themselves. According to the ‘Revitalising Dunes in Kennemerland’ report by PWN, the water company who own the parkland, by the 1930s dune birds such as the short-eared owl, the golden oriole, and the red-backed shrike were racing towards local extinction. Noting the installment of artificial dune barriers and the encroachment of non-native vegetation, the blame was placed upon the decline of a common food source: specialist insects that need patches of open sand in a shifting dunescape to survive. Since they also debark shrubs and trees, and encourage the dispersal of native grasses through their manure, the bison are essentially bringing back the original biodiversity for free. 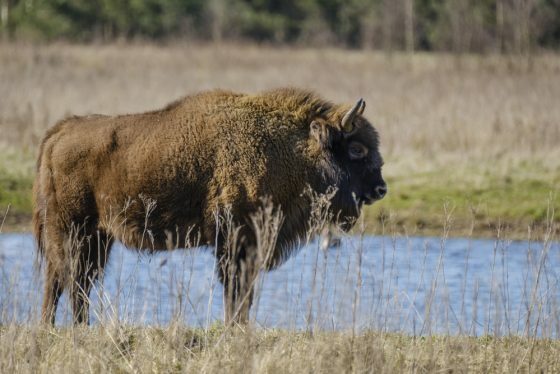 There are currently 22 European bison in the enclosed Kraansvlak section of the Zuid-Kennemerland national park. It lies between Haarlem and Zandvoort, and can easily be reached by car and public transport. For the time-constrained, there is a viewing area overlooking a small lake — Meertje van Burdet — that can be reached in 30 minutes by foot from the Kennemerduinen Visitor’s Centre. It’s not likely you will see the bison from here, but I suppose it was my lucky day! For the intrepid, there is a 1.4 km path known as the ‘bison trail’ that cuts across the Kraansvlak enclosure from Bloemendaal aan Zee, and is simply that: a trail. As may be frowned at by visitors from more protective societies, the Dutch do not always put fences around their canals; neither do they fence off their bison paths. Since the Polish migrants were first released from their long-haul journey in 2007, there has not yet been a bison-human incident, I was assured. However, a shifting rota of volunteers patrol the trail making sure that no one strays from the well-marked trail just in case. There is a catch involved: the trail closes on the March 1 until September 1, on account of the migrant bird-nesting season. So, if you would like to traverse the up-and-down dunes, with your heart rate beating as much from the physical exercise as the excitement of maybe seeing Europe’s largest megafauna round the next hill, get down to Haarlem quick!